Swami Chinmayananda Saraswati (born as Balakrishna Menon on 8th May 1916) inspired the formation of Chinmaya Mission in 1953, which is a worldwide non-profit organisation, to spread the knowledge of Advaita Vedanta, the essence of the teachings of the Vedas. He had close links with Sri Ma Anandamayi right from his stay in Rishikesh, where he was with his sannyas guru Swami Sivananda. He later studied under Tapovan Maharaj in Uttar Kashi. He taught the Bhagavad Gita, the Upanishads, and other ancient Hindu scriptures in English across India and the world. The Chinmaya Mission has more than 300 centres world-wide. He wrote many books including commentaries on the major Upanishads and Bhagavad Gita. His work continues to provide cultural and spiritual instruction globally; he left the body on 3rd August 1993. Swami Swaroopananda has now taken over the reins of the Mission from Swami Tejomayananda. 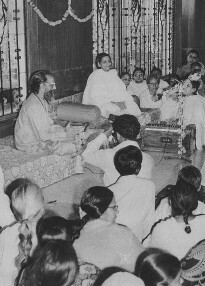 Below are some photos taken during Sri Ma’s visit to the Sandeepany Sadhanalaya, the Mumbai Ashram in mid 1970s, courtesy of Chinmayananda Mission. 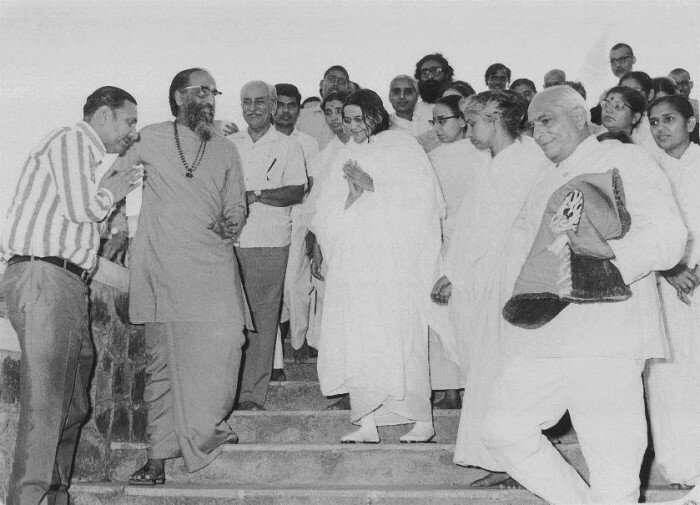 In the spring of 1979, Pujya Gurudev Swami Chinmayananda was among a group of distinguished swamis who were invited to speak at the 83rd birthday celebration of Anandamai Ma held in Bangalore. 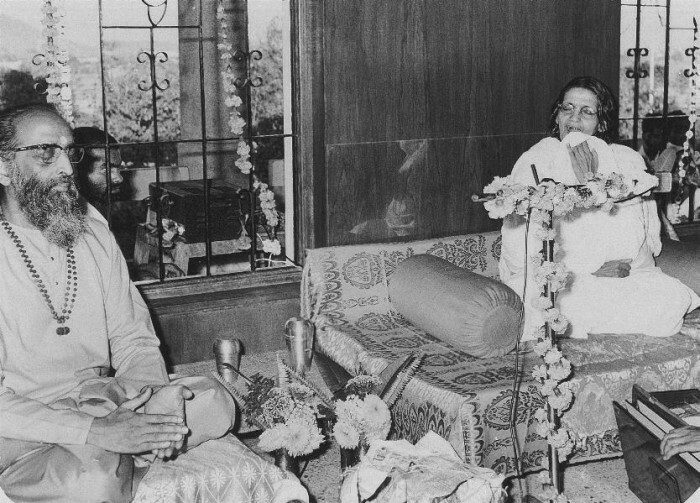 She had been a guest at Sandeepany Sadhanalaya Powai in 1975; and, although the exact date of his first meeting with her is unknown, it was sometime during his days in Ananda Kutir when he was a student of Vedanta. Swamiji had developed a problem with his practice of pranayama (breath-control exercises advocated in Yoga) and Swami Sivananda had sent him to Anandamai Ma for assistance. Pranayama had led him to be constantly hungry, no matter how much he ate. It is reported that Anandamai Ma asked for four rotis to be brought, and directed Swamiji to eat a bit from each. She then asked him to place the rotis on his head and also place his right hand on top of the rotis. The problem got cured! In later years, Swamiji related this incident in Delhi, and said, “Which shastra says that you keep jhuti (already tasted food) rotis on the head and the jhuta hand on the rotis, and it will reduce hunger?” Gurudev was indicating the #greatness and divinity of Anandamai Ma.